Makeup Forever has came out with these new Rouge Artist Natural lipsticks in 50 different shades. 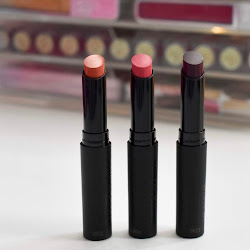 The color range is one of the best I have seen for lipsticks and they are all gorgeous for spring. I was lucky enough to get this lipstick in my Bloggers Preview event bag from The Makeup Show LA. I have been using it ever since I got it and I cannot put it down. 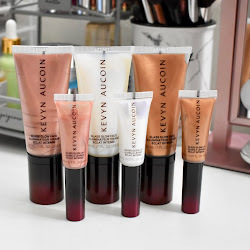 To see swatches and what I think about this lipstick more in depth, click read more. After the success of Rouge Artist Intense and its ultra-pigmented colors, MAKE UP FOR EVER launches Rouge Artist Natural. It is inspired by a return to naturalness, a key trend for spring 2012 focusing on fresh, vibrant tones in wardrobes and vanity cases. Applied with fingertips or a brush, color stays true and sublime under the effect of Candelilla plant wax and beeswax, which help the pigments adhere perfectly to the lips. It protects and embellishes with its creamy, ultra-sensorial and violet-scented texture. On the border between lipstick and lip care, it delivers 8-hour hydration to the lips. 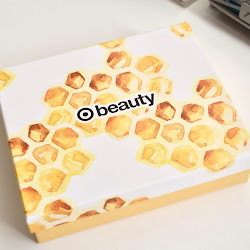 Its secret: a moisturizing cocktail of vegetal castor oil and Cupuaçu Butter for exceptional glide and lips that stay silky all day long. Makeup Forever Rouge Natural lipstick in N20 is described as iridescent pink gold. It is so gorgeous and more so on the lips. It was also one of the most moisturizing lipsticks that I have tried. The color lasted and my lips didn't feel dried out at all. I actually applied this with a lip brush to get it more precise. No need for a gloss, since this has a shine to it already. Also really comfortable wearing, almost forgot I was wearing a pigmented lipstick. These retail for $19 and can be found at Sephora. Check out the Makeup Forever website to see the full range of colors that are available. Let me know what you think of these. This is a really pretty color! I like the way it looks on your lips alot!